Protagonist Arata Kaizaki is a 27-year-old NEET (Not in Education, Employment, or Training). 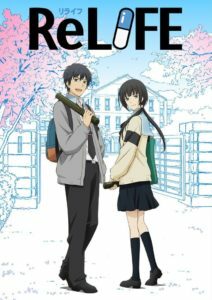 One day, a researcher from the ReLIFE Laboratory makes an offer to him to join an experiment in which Arata’s youth would rejuvenate and he could spend one year as a high school student. 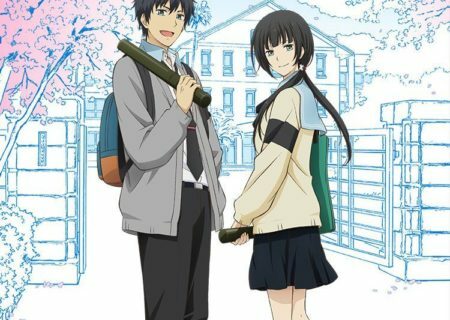 Kaizaki accepts the offer and decides to go back to high school for a limited time. Kaizaki enters the second semester is appointed to the executive committee of Aoba Festival. He is embracing his feelings for Hishiro. Hishiro too has started to have feelings for him after the fireworks, but can’t sort out what exactly she was feeling. Their time is limited and the ‘ReLIFE’s end is approaching with the graduation ceremony. The popular manga ReLIFE is serialized on the entertainment platform comico. The anime adaption aired in July 2016 on Tokyo MX. In addition a life action movie hit Japanese cinemas on 15 April 2017.